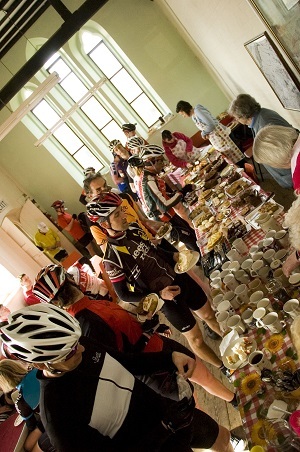 If you've never ridden an Audax event before then expect a relaxed and friendly atmosphere (it's not a race), a variety of different types of riders and bikes and an enjoyable day out on some roads that you may not have ridden before. The ride is self guided and not sign-posted or marshalled so you should be competent at following a route sheet and carry tools, clothing and food to keep yourself out of trouble. You can ride at your own pace, as long as your overall average speed, including stops, stays between the minimum and maximum specified for the event . At the start you get a brevet card, which has to be filled in at each checkpoint, to show that the course has been completed. The opening and closing times of the checkpoints (including the finish) are based on these minimum and maximum speeds. Hill Village Hall - Under the capable control of the local Church group and WI you will not believe how much cake, pavlova and home baked produce is on offer here. Doynton Village Hall - Now rivalling the Hill control for quantity and quality of food, The Wick and Doynton WI will be providing a huge selection of savoury and sweet options with hot soup if it's cold and/or wet. Glastonbury Town Hall - This control point will be manned and stocked by City Of Bristol Rowing Club who will be looking after and feeding hungry riders all afternoon. The Drum and Monkey Pub, Kenn - Not far from the finish, this is a useful stop for a bar snack or swift half to get you through the last few kilometres. Barry's Bristol Ball Buster uses all four controls. Barry's Bristol Blast uses the Doynton and Glastonbury controls. There are also info controls, where you will need to answer the question given on your brevet card about a location on the route. If you do not put the correct answer on your card then we cannot validate that you have completed the ride. Sunrise is at about 07:00 Sunset is at about 19:45 so you will need lights for the long route and should consider carrying lights for the short routes. 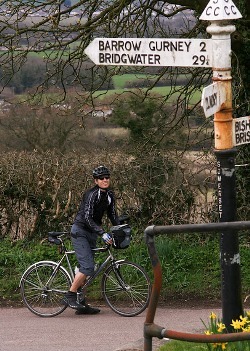 Sections of the route are on narrow country lanes where there will be some mud and grit on the roads. It is strongly recommended that you fit mud guards to make the ride more comfortable for yourselves and those riding behind you. As with any Audax event you should be self-sufficient and will need to navigate the route yourself using the route sheet or a GPS device. Be prepared to get yourself home in the event of any issues that prevent you from carrying on.